Great point, great question. The answer to that question actually comes at the beginning of the show, in which Max and Stacy remark on the number of think tanks in the U.S. and U.K. which tell us all what to think, and what they tell us to think about inflation is that inflation is good and normal, while deflation (i.e., prices going down) is horrible and socialistic. 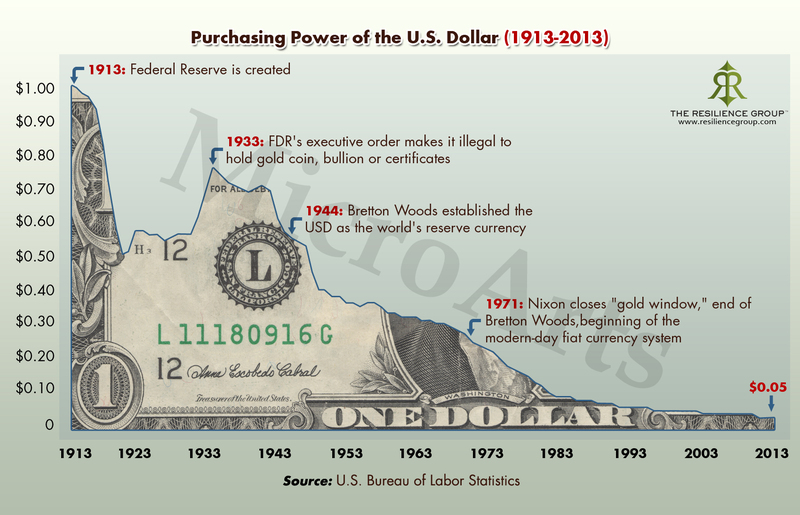 Likewise, as previously noted on this site here, the dollar has lost essentially all of its purchasing power since 1913. Unfortunately, it is “fantastic”–as in “pure fantasy”–because the banks and the all-important Financial System are all about seeing to it that prices always go up, never down. That ensures that you must always borrow money from the Financial System, never able to survive off the fruit of your own labor (as discussed in yesterdays post: PRICE-RIGGING IS THE NAME OF THE GAME: TAIBBI’S LATEST). Ah, the system works! This entry was posted in Debt, Debt Slavery, Everything Is Rigged, fiat currency, Financial Terrorism, Keiser Report, Price, Price-fixing, Redistribution, Rent-seeking, Rentier, Reverse socialism, Wage slavery, Wages, Wealth transfer and tagged deflation, fiat currency, inflation, Max Keiser, rent-seeking, Rentier, Save our Savers, Simon Rose. Bookmark the permalink. I never thought of this as intended to make people borrow. They taught me to think of it as making the economy grow or something I obviously didn’t really understand. “Wage growth has been particularly slow in the aftermath of the recession. Real wages have declined 7 percent since 2007 and the pace of growth has been slowing down. There are currently about three job seekers for every job opening — making it risky for the employed to push their bosses too hard for pay increases — and those who do find a job are increasingly ending up in work that pays very little. Please donate to the Vos family on the Go fund me so we can win one house back at a time and make our money worth the paper it is written on. See the donation site link above. We can do this.